Combine all of the dough ingredients in the bowl of a stand mixer and mix them together with a dough hook. Once the dough has just come together, pour the dough on a lightly floured surface and knead for about 8-10 minutes, or until soft and smooth (the dough will be kind of a pain to mix, and if it’s just too dry, add 1 tsp water to the dough at a time until it’s more manageable). Place the dough in a lightly greased bowl, cover and let rise until doubled, about 1 1/2 hours. Uncover the balls and let them sit for 10-15 minutes to develop a tough skin. In the meantime, preheat the oven to 425°F. Before placing the balls in the oven, mist them heavily with water. 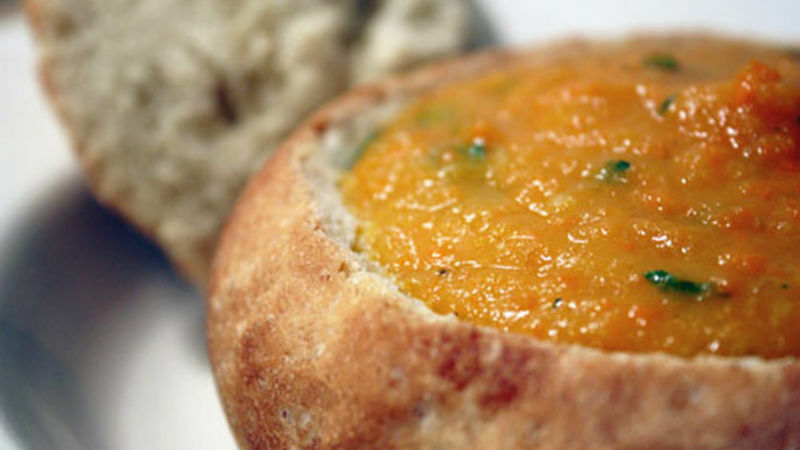 Bake the bread bowls for 18-22 minutes or until they’re a deep, golden brown. Turn off the oven and prop open the door a bit, leaving the bread bowls inside for 15 minutes to develop a thick, tough crust. Remove the bread bowls from the oven and let cool completely on a cooling rack before cutting. Cut off the tops and remove the insides, leaving about a 1/4-inch thickness all around the inside. Fill the bowls with your favorite hearty soup or chili.